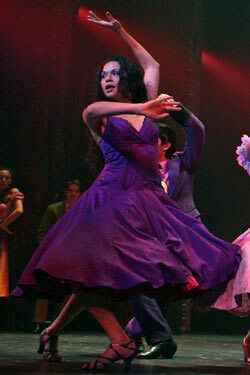 With her long hair, long legs, and big voice, Karen Olivo had already become a Broadway darling for In the Heights before she left the show to take on the role of Anita in the current revival of West Side Story. Now she’s up for the Best Featured Actress in a Musical award at the Tonys on June 7. She spoke with Vulture about her hair, her schedule, and switching from being a vegan to a pescatarian. We have a rehearsal for the performance for the Tonys at 3:30, so I’m driving into the city from New Jersey, where I live with my husband, Matt Caplan, who plays Professor in South Pacific. We bought a house there, but before that, between the two of us, we’d lived in all the boroughs. How has West Side Story changed for you since you started previews back in February? I’ve never had a musical where I had to dance as heavily as I do in this show. I’m realizing we have to treat ourselves more like athletes than actors, because if the body doesn’t have recovery time, you literally cannot perform things. I’m very careful with what I do with my body outside the theater. I don’t walk as much as I used to. I try to never take stairs because I can only assume I’m wearing away the cartilage in my knees, being in heels and doing this really strenuous dancing. I don’t just pop out of bed anymore. What’ll you do after the Tonys rehearsal today? I’ll try to get something to eat. My husband and I used to be vegans, but now we’re pescatarians. I had to switch because I was getting injured in the show a lot and I realized that [the injuries] were not healing because I wasn’t putting enough protein in my body. The choreographer and my instructor said, “We really think you should probably put some fish into your diet at the very least.” And they were right in that my injuries started to heal. I’ll start getting ready for the show. A physical warm-up and a vocal warm-up. Then, at 6:30, I start paying attention to my hair, because I wear my own hair in the show and it takes me at least 45 minutes a day to get ready. I wet it and throw some gel in it, but with all that hair, after I wet it, I have to defuse it with a hair dryer, so that’s why it takes so long. You’ve gotten props for creating an Anita that’s not a rip-off of prior performances and isn’t a fiery Latin tintype. Who is she to you? I never really think about her as a separate entity. I think about her as just being me, like an alternate-universe Karen. I grew up in a Spanish household; my dad is Native American and Puerto Rican and my mom is Chinese and Dominican. I was born in the South Bronx and we moved to central Florida when I was around 7 years old. At the time, the South Bronx was really, really tough and my parents worried about three girls growing up into that. Have you ever seen director Arthur Laurents’ nasty side? Never. I think it’s hysterical. Reporters give me these loaded questions, “How is it to work with him?” Like I’m going to give them some juicy tidbits, and it only makes me realize that they’ve never worked with Arthur. He’s an extremely truthful person, and most people who have a problem with him have a problem with him being honest with them. Would he give you blunt direction?